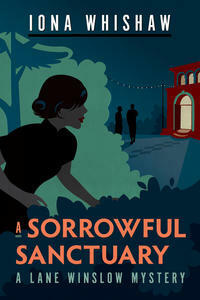 A Sorrowful Sanctuary, the fifth book in Iona Whishaw's Lane Winslow Mystery Series, is finally here! Whishaw is currently touring the country with dates in Quebec City, Montreal, Ottawa, Toronto, and Hamilton from October 10 to 14. In the meantime, enjoy her recommended reading list of books in which characters—like her own Lane Winslow—find their stories in being out of place. I’m fascinated by the misplaced, and I’m drawn to the stories of people who must act in places that are unfamiliar, especially when these people are affected, knowingly or unknowingly, by the influence of the past. As I selected the following books, I realized that they reflect the displacement I felt growing up in four distinct cultures and moving from place to place. My own books mirror the life of someone who has moved several times, someone who has not quite succeeded in putting down roots—mainly from a lack of practice. The trauma of war bifurcates the lives of many into branches of what existed before and what remains after; so too can the past feel like an alternate plane of existence, leaving survivors feeling fragmented as they are grafted into the circumstances of their new lives. Many of my characters have come from various sorts of wars, both personal and geopolitical, as do those in the books I have chosen. I picked this book because the writing is sublime (Hunter is also a poet) and there is this delightful, airy near interface between nineteenth-century ghosts who try to connect with historians archiving the house they inhabit, wanting them to recapture their lives and stories before they disappear forever. That story is juxtaposed with an unsolved mystery of a little girl who, while under the care of her 15-year-old babysitter, disappears and is never found. The babysitter—now grown and one of the archivists—is haunted by her own guilt about the girl disappearing and is in her own way a kind of ghost as well, residing in an indeterminate space between living and only existing. It reminds me of the space I like to write in, a place where things that happened in the past have a present-day effect in people’s lives and deaths. This is on my list because it is a terrific exploration of how a people who have strong pacifist views and hold themselves apart from the society around them inevitably must confront their own beliefs about themselves as they intersect with the larger world. Trouble comes when a young man questions how his Mennonite community can call themselves true pacifists when the wealth of their crops and animals goes toward feeding soldiers fighting in the war. Wiebe powerfully depicts the tension between disparate cultures when insular groups of people relocate to a place where they believe they can live out their lives without being affected by larger events. Another group with a strong pacifist culture, the Doukhobors, came to Canada and were confronted with the same kinds of issues; they make an appearance in my second book. This is my favourite book of short stories. It immediately captivated me because I felt I could place myself in the lives of Gallant’s characters, all of them displaced and in an alien environment, which is what I felt much of my young life. These stories are about the generation of people who lived through the Second World War, as my parents did. Gallant’s detailed yet understated writing mirrors for me the sense of restraint that characterizes British culture, as well as life within my family, in contrast to the exuberant worlds I found myself in while in Mexico. Biculturalism is at once limiting and freeing; the characters in the Gallant stories have the same slightly dissociative responses to the environs they inhabit but are not fully connected to. Impressively, the author has painted with just enough colour from the backgrounds of her characters to flesh them out completely; she presents real people freed from the fetters of their pasts and where they are from while they remain limited by not quite belonging in the new place. Here is the ultimate story of that first-generation child, wedged between the traditional world his Chinese parents and grandparents cling to, and his own experience as a Canadian born into this new world. He too can wander and struggle to form an identity between two worlds, not entirely of either. Any of us born here of immigrant parents can relate to being steeped in the culture of the family but eventually moving outward towards whatever you become when you begin to plug yourself into the new world. An engaging, beautifully, and emotionally written coming-of-age story. This is a memoir of the early days of the German refugees brought here from Bohemia in 1939 and accorded a very isolated, nearly swampy land in Peace River country. Though it was almost entirely unsuitable for farming, they were told they were to farm it. It was the inspiration for some of the events in A Sorrowful Sanctuary. I find this story interesting on several counts: first, Canada was not known for accepting refugees of any kind during the war, so it is remarkable that we provided sanctuary for this group of urban Germans who were fleeing Hitler; second, these Germans were treated disdainfully, and in spite of the money provided by Czechoslovakia to the Canadian government, they were given poor equipment and worn-out animals to work with; it was as if, once having accepted refugees, the country was not prepared to do anything that was of much use for them. Finally, it is a very touching first-person account of what it was like to be suddenly thrust into a completely foreign environment without knowing the native language or having the background or experience necessary to survive in the new setting—but, most wonderfully, Amstatter shows us how against every odd imaginable thrown at them by man and nature, the German refugees ended up creating a thriving community. Here again are strangers in a strange land. What most impressed me was the exploration of how being an alien living in the turbulence of wartime can sever the ties people have to the restrictions of their own upbringing; this sense of floating free from inner limits broadens one’s view of the world. In this book, narrow concepts of love are thrown wide open. There is indeed the physical and searing emotional passion of an illicit affair, but there is also the love of the spirit of “other,” (as the nurse has for the English patient). We also see love based on youthful exuberance and unfounded hope (as witnessed between the nurse and the sapper), and the love that becomes the fundamental substance of memories, which are all that are left for the patient. I chose this book because of the layering of time, so skillfully and lyrically achieved by building the story through shifting the narrative between the events in the nineteenth century and the 1920s. We see a character in the new and expanding Hollywood of the late 1920s who wants to make a heroic film about an event that took place 50 years before as they interview the last remaining person involved. Instead of being “told” of the events, we are transported to them and live them as readers. These layers of time make the book rich and textured, imparting a palpable impression of the influence of history on its own future. It also serves to rip away the moderating influence of time on stories so that what seemed heroic years later is revealed in its true gritty, bloody, morally compromised human mess. This book is written by a social worker in the 1970s who collected stories from Home Children themselves—or their direct descendants. It is made up of short recollections that cover everything from when the children were first picked up in England to what it felt like to arrive in Canada, as revealed through their experiences in the homes and on the farms where they were placed. It is one of the most moving books I have ever read. I was deeply impacted by how children were torn from their environments—even while many of them had living parents who were not consulted—separated from siblings at a young age and put into often-hostile environments. This caused them to suffer from a devastating sense of abandonment that many of them carried right into extreme old age, even when many survived and went on to do well. There are many hundred thousand Canadians who are descendants of Home Children. Joanne Kilbourn, Bowen’s educated professorial woman sleuth, is the epitome of someone who approaches the deaths she has to confront with a kind of cerebral compassion and a practical sense that action is the answer to misfortune. In this book, she must tell a distraught wife about the bizarre circumstances of her husband’s death, confront the complications of her romantic relationship with an Indigenous police inspector, and, most interesting to me as a former educator, find a way to understand a difficult and repellently angry, confused, and apparently victimized student. Bowen’s characters are real down to their bones. I worked most of my young life with angry, unhappy teenagers, and in Kilbourn’s writing I recognized that combination of reluctance to deal with prickly fractious rage and the compassion one has to muster to get below it, to reach the human pain that drives it. She has created a most admirable and egalitarian character full of the characteristics I think I’d like to have: pragmatism, bravery, compassion, affection, intelligence and clear thinking. I chose this 1996 book of poems by this Metís/Cree Vancouver poet because it is the first of his I read. And Scofield was kind enough to come to my classes to read to my students and speak to them about his work and his life on the streets of Vancouver, revealing to them the places he describes in ways they hadn’t been alive to before. The collection of poems is perhaps the ultimate portrayal of displacement and the struggle to find place and identity in a hostile and alien environment: biculturalism compounded by sexual identity and confusion about how to survive. The poems are whittled down to their emotional essence—there is no confusion about the world the poet exists within; he reveals to us the harshness of the Downtown East Side without holding back. Scofield’s poetry elevates people and their experiences by his loving and terrible inclusion of them and forces us to see it and feel what it is to be marginalized, dismissed, and displaced in the urban rez.